Thacher School Administration Building. 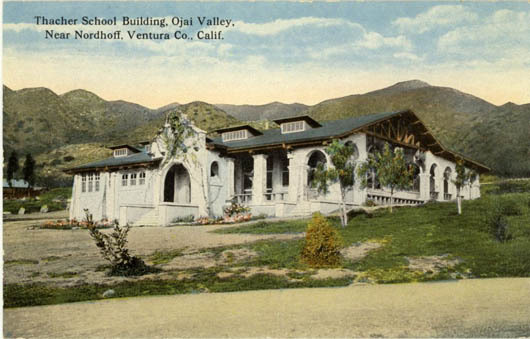 Several original Thacher School structures were destroyed in a 1910 fire. Sherman Thacher asked Arthur B. Benton, who was designing the first Nordhoff High School campus, to design the new Thacher administration building and dormitory. Arthur Benton, best known for Riverside’s Mission Inn, was one of the first proponents of Mission Revival architecture. Completed six years before Libbey’s transformation of downtown Ojai, the Thacher Schoolhouse is probably Ojai’s first Mission Revival building. Among those who once boarded here were author Thornton Wilder and businessman Howard Hughes.